D23 Expo, the massive Disney convention that brings together all facets of the Walt Disney Company every other year, brought no shortage of great news for Mickey Mouse fans recently. Among all the developments in the pipeline, the most game-changing is arguably the major additions to Walt Disney World and Disneyland -- meaning the world's first Disney park and each of the four Disney World parks in Orlando will be getting at least one new project over the next few years. Here, five upcoming park debuts that we're most excited about. 1. Star Wars galore on both coasts. Ever since Disney bought Lucasfilm and gained the rights to Star Wars in 2012, there's been speculation as to what else Disney would do with the franchise in its theme parks (beyond the existing Star Tours attraction, Jedi Training Academy, and Star Wars Weekends). Disney CEO Bob Iger finally gave us the answer: the addition of a 14-acre Star Wars Land to both Disney's Hollywood Studios and Disneyland Park -- the company's largest single-themed expansion to date. The new area will have two attractions that lets guests control the Millennium Falcon, and puts them in the middle of a battle. Throughout the expansion, expect to find characters from the films, highly themed environments, and the cantina from the original movie. 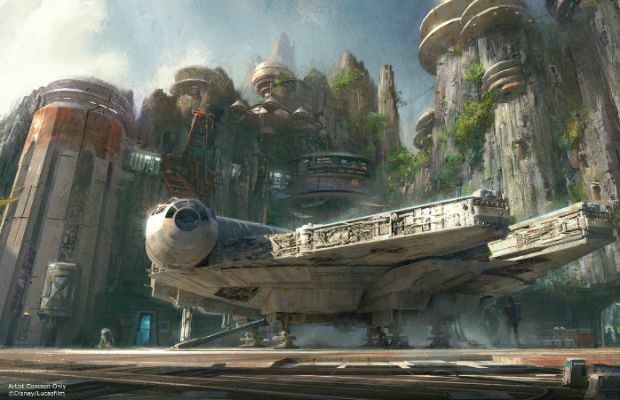 The opening date for Star Wars land has yet to be announced, but more immediate additions will come into play, too. Disneyland and Disney's Hollywood Studios will open a special exhibit called "Star Wars Launch Bay" later this year, giving guests a sneak peek at the upcoming film Star Wars: The Force Awakens. Additionally, those two parks will also get a new experience from the latest film at Star Tours, and kick off a special event called Season of the Force in early 2016, during which Disneyland will turn Space Mountain into Hyperspace Mountain and offer themed entertainment, food, and more in Tomorrowland. At Disney's Hollywood Studios, look out for a new fireworks display synchronized to the film score. 2. Toy Story Land in Florida. 3. More to do at Disney's Animal Kingdom at Disney World. This fourth theme park at Walt Disney World has long been regarded as a half-day park, but Disney is hoping to put an end to that notion by introducing "Rivers of Light," a new nighttime show in the vein of Disney California Adventure's "World of Color." Set up along Discovery River, the show will have live performers, floating lanterns, water screens, and music. What's more, to keep guests in the park later, Kilimanjaro Safaris will debut a nighttime trek next spring, in which you can travel through the savanna and see the "setting sun" through tricks in lighting. The safari will get some new faces, too: African wild dogs and hyenas. Speaking of Animal Kingdom, we also learned that the area that will be dedicated to AVATAR, the highest grossing movie of all time, will be called Pandora -- The World of Avatar and debut in 2017. Its centerpiece will be Flight of Passage, an attraction that takes guests for a special effects-filled ride on the back of a Banshee. 4. A new experience at Soarin'. One of the best attractions at any Disney resort is Soarin', a simulator that takes guests on a hang glider ride over California. It hits almost all of the senses, as you get to see and smell -- and, in some cases, feel -- the Golden State's beaches, ski slopes, forests, and orange groves. Disney will also revamp Epcot and Disney California Adventure's Soarin' experiences by taking guests to landscapes from around the world. Epcot is adding a third theater to the show building, too. 5. The Magic Kingdom's new restaurant. The world's most attended theme park is getting a new restaurant themed to the Jungle Cruise attraction. Skipper Canteen will move into a space near the Adventureland attraction and will have several dining rooms staffed by skippers from the cruise. Not many details have been announced for the project, other than that it'll open later this year, but we expect that you'll be served with the same shtick that has been reserved for the Jungle Cruise for decades. From the Editor: Our New App Has Arrived!